We will meet at Pat’s place this Tuesday. 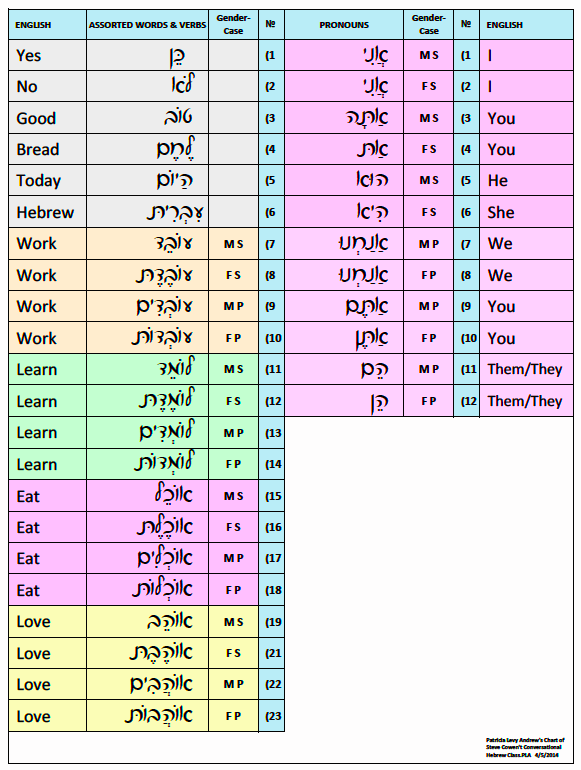 Until then, use the flash cards below to switch from reading print to script and to memorize and write the pronouns. Then practice using the correct pronoun with the following vocabulary chart. “Read, Write, and Say” is our homework motto. Read each word, write it, and say it. In class next week, we will add “Do it”. This entry was posted in Conversational Hebrew Classes, Events, Calendar, Hebrew, Hebrew Script, Messianic Jewish Dance Practice, Writing Hebrew and tagged Conversational Hebrew Classes, Hebrew, Hebrew Homework, Messianic Jewish, Messianic Jewish Dance, Messianic Jewish Dance Practice, Modern Hebrew, Reading Hebrew, Speaking Hebrew, Writing Hebrew.